I picked up a tin of Crosman Piranha Pellets from Wal-Mart at a decent price. They are a 10.5 grain domed/hp pellet. I was looking for a heavier pellet for use in a Springer. Has anyone tried these out? The 10.5gr Premier domed shoot a lot better. So does the JSB and Air Arms 10.34gr and H&N Barracuda and Barracuda Match 10.6gr.. I am shooting a 12 ft lbs rated rifle that has a new spring and shortened barrel. I'm hoping for a smoother shot cycle and better accuracy compared to the Crosman 7.9 gr. pellets. In the next few days I'll post some groups. x2 on what Hotair says. The JSB (or Air Arms) 10.3gr and Baracuda Match 10.6gr group the best in my experience. The 10.5gr Crosmans used to be really good as well but they've been comparatively disappointing in recent years. In terms of optimal pellet weight, the 10 grainers are usually better suited to a 15fpe+ springer. For a 12fpe springer, an 8 grainer is likely to be a better match. If you have a chronograph, try both and see which produces more energy (fpe). Accuracy is more important than energy of course but it often works out that a springer will group best with a pellet in the weight range that produces the highest energy. If you are only shooting a 12fpe springer I would suggest you try the JSB or Air Arms 8.44gr and the H&N Field Target Trophys 8.64gr in different head sizes such as 4.52 and 4.53mm. 4.52 head size in general seems to be most preferred in general in my 12fpe springers. As Nervoustrigger stated 8 grainers would be recommend in your case. The JSB and Air Arms 8.44gr are dead nuts accurate in many of my guns in general of all varying power levels whether PCP. springer or CO2 or pumpers including pistols believe it or not. Some of my guns shoot them screaming hot and they are still dead on. 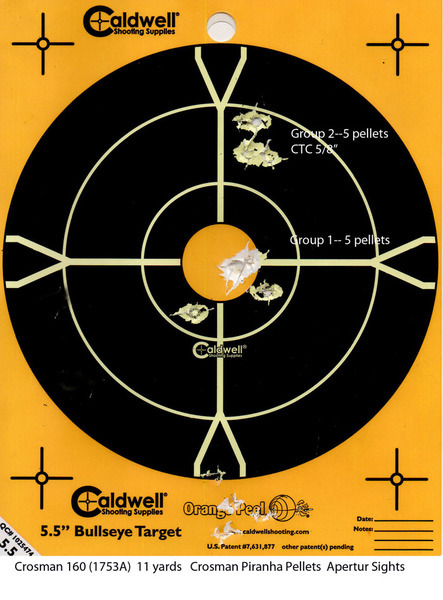 I was testing a Crosman 160 recently and the Piranha pellets were handy. I shot two groups, the second of which was better after I was a little more used to the gun. It's possible another pellet would do better, but this performance is acceptable. I've shot half a tin of the CP Piranhas over the last few weeks. In my Gamo Maxxim Swarm, they tend to produce a much looser cluster, mostly over 1" ctc at 12-15 yds. My HW97 doesn't like them at all but does shoot a Gamo 9.6 Rocket fantastically (incidentally, my Gamo's favorite pellet). YMMV but I'm not going to buy any more Piranhas. Try shooting them loaded backwards, you may get better results.